As pediatric occupational and physical therapists, we always need to remember that one of the most important, if not the MOST important, aspect of our job is to educate. We need to let students, teachers, school staff and parents know what we do and why we do it. One way to support this process is to provide hand outs with educational information. Keep in mind when you do provide hand outs do not overwhelm people. Information is easier to digest and understand when providing in smaller amounts. 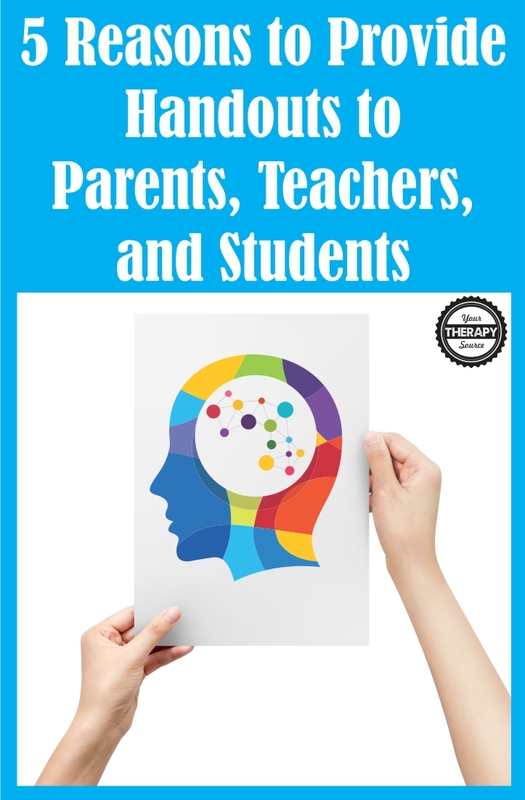 Here are 5 reasons to provide handouts to parents, teachers, and students. Memory boost: hand outs help to provide a review for teachers and parents about what was discussed. Reminders: a handout can help remind what steps needed to be taken to carry out the suggestions. Written Explanation: it can be hard to understand all the recommendations when speaking quickly in a meeting (or passing in the hallways) therefore a hand out helps to explain the details in writing. Full attention: when you are explaining a technique, new suggestion or tip let the person know you will follow it up with a hand out so they can give you 100% attention while you discuss it and not have to take notes. Written record: by providing a hand out you can go back and reference it if goals are not met to tweak or change the activities or suggestions. 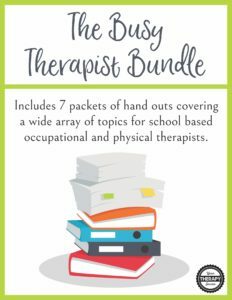 Check out The Busy Therapist Bundle for over 100 hand outs for parents, teachers, and students. The topics include fine motor, gross motor, executive functioning, handwriting, visual perceptual and sensory processing skills. Find out more here.